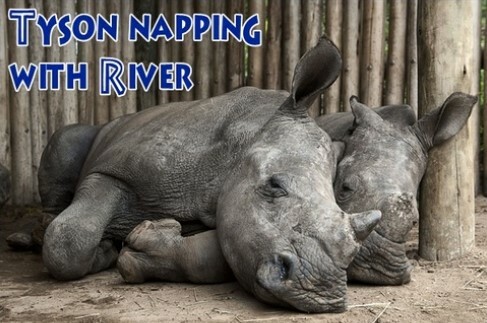 Baby Rhino Tyson at Baby Rhino Rescue | Adopt and Donate Now! Tyson arrived at Care for Wild Africa in October 2014. His mother was poached in the Kruger National Park. Even though Tyson had been alone for a few days, he was in good condition when he arrived. He remained calm in the crate, which is unusual. As soon as he was released from the crate he became boisterous and difficult to manage. He was introduced into the enclosure which at that point had River, Thor, Mabush, Wyntir and Tana. He was feisty and pushed all the other rhinos around, especially going a few rounds with Mabush and earning the name Tyson. It was all a little dramatic for those watching, but the rhinos quickly settled down. Tyson is a very loving rhino and affectionate to all he comes in contact with. The volunteers love Tyson because he is such a handsome, sweet rhino. He shares his enclosure with River and Thor and the three rhinos are very close. They love to joust and are like rugby players, tackling one another and charging. Tyson has moved into a beautiful new enclosure with lots of green grass, a roomy night pen and a big mud bath. During the day he goes out into the back area, to mingle with Wyntir, Tana and Mabush. In the hot months of summer, he reclines in the shade of the big mango trees with his buddies.